Despite not catching enough shuteye because of a delayed flight, Jerry Seinfeld continued Friday and Saturday on his Jewish roots tour around the Holy Land. Friday evening, after flying to Jerusalem by private helicopter and checking the President's Residence off his list, Seinfeld sat down to lunch on the rooftop balcony of a local architect with a view of the Western Wall and the Temple Mount. There he dined on an exquisite meal of fish, lamb chops, and Arab sweets prepared by an American chef. 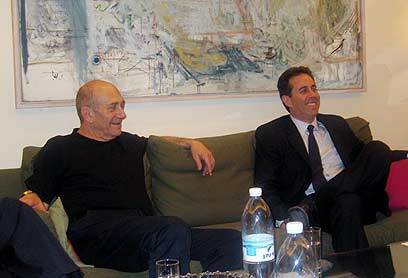 From there, Seinfeld and his entourage moved on to an archeological tour of the City of David, shook hands with PM Ehud Olmert, and got in a thirty-minute prayer session in a sentimental visit to the Westen Wall. Friday evening was spent at Tel Aviv's exclusive restaurant Rafael. Foregoing the countless reruns of "Seinfeld" that aired Friday (which run just as often when he isn't here), he chose instead to start off Saturday morning with a visit to Masada. One restaurateur in Abu Gosh spread mid-day rumors that Seinfeld was heading there for lunch, attracting a crowd of photographers (who probably noshed on humus during the long wait), but the American comic was instead flying over Makhtesh Ramon in the south before embarking on a tour of the Old City of Jaffa. Sunday, he will fly to the north, take part in a press conference at the Tel Aviv Hilton and attend the festive Tel Aviv premiere of his new animated film "Bee Movie." See all talkbacks "Jerry's journey to Jerusalem"